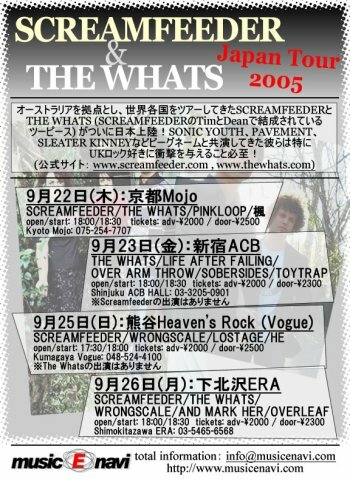 Life After Failing is going to play Shimokitazawa GARAGE on Sunday, October 1st. Tickets are available from the venue. This event will be a "3-man Live", which means that there'll only be 3 bands playing that night. It's an event that gives the audience the most exposure to bands that have already proven themselves at that venue. Tickets are 2000 Yen in advance, 2500 Yen on the same day. Advance tickets may be reserved at the web site from the Live schedule page. LAF will play at Yukotopia on Saturday, September 30th. Tickets are 1,500 Yen + 500 Yen for one drink. 17:30 Open / 18:00 Start. Stay tuned for any updated information as it comes our way. An outdoor event @ the Outdoor Stage close to the NHK broadcast buildings at Yoyogi Park, Tokyo. Admission is free. Life After Failing was joined by Toshiyuki Takeo and Kaneko Arata on guitars for what turned out to be a spectacular, 100% improvised free jam session. The interaction between all four of us was absolutely inspiring. We look forward to hearing the CDs from various tapers in the audience. To all who fought the crappy weather from the typhoon in the neighbourhood, we thank you for coming. LAF will play at Yukotopia on Saturday, August 5th. Tickets are 1,500 Yen + 500 Yen for one drink. 17:30 Open / 18:00 Start. Don't miss the Jerry's Week Special of events at Yukotopia. Fantastic bands each night of the week. LAF will play at Yukotopia on Thursday, June 29th. Tickets are 1,000 Yen + 500 Yen for one drink. 20:00 Open / 20:30 Start. LAF will play a 90-minute set this night, so fans get a chance to see more band for less money at this event. Come on out! 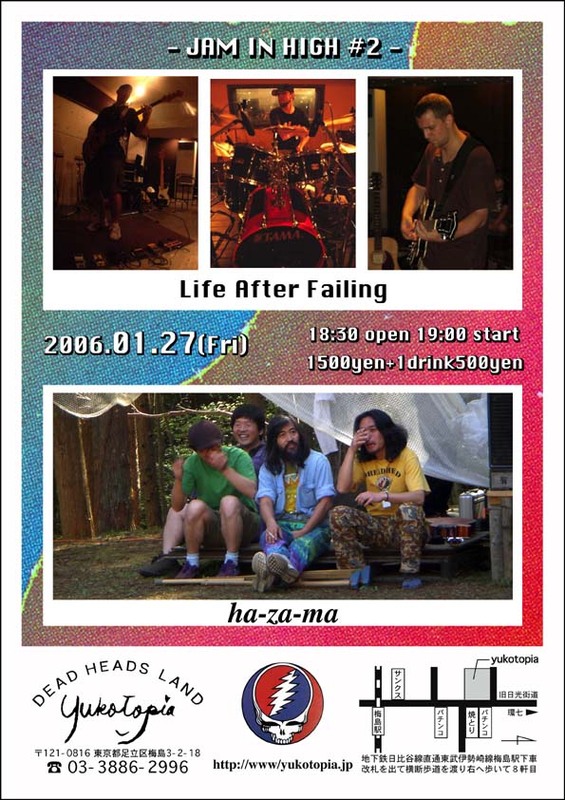 Life After Failing has just been booked to play Shimokitazawa GARAGE on Thursday, June 8th. Tickets are available from the venue: 2000 Yen advance, 2500 Yen same day. Advance ticket reservations can be made from the web site's schedule page. Open 18:00 / Start 18:30. The band has been booked to play Dead Heads Land Yukotopia on Sunday, May 7th. Tickets are 1,500 Yen (+500 Yen for 1 drink). *The Holly Brothers could very well be a secret gig by Tokyo-based jam band MELTONE. We know for certain that it's headed up by Shin-Ichiro (Meltone's guitarist), so it will be very interesting to see how this gig turns out! Tickets are available from our store page or direct from members. We hope to see you there! The band will be appearing at Dead Heads Land Yukotopia on Tuesday, March 21. Tickets are 1,500 Yen (+500 Yen for 1 drink) and can be purchased from Yukotopia or online from our Store page. For more information, please contact us at: info@lifeafterfailing.com. Doors open at 17:30. Show starts at 18:00. This show can be downloaded from the Live Music Archive and bt.etree.org! The band will be appearing at Dead Heads Land Yukotopia on Friday, January 27. Tickets are 1,500 Yen (+500 Yen for 1 drink) and can be purchased from Yukotopia or direct from the band. For more information, please contact us at: info@lifeafterfailing.com. Update: It's now possible to purchase tickets online direct from our Store page.